We sat down with Mary Furlong to discuss trends in the senior living marketplace ahead of the Washington Innovation in Longevity Summit in DC on December 10, 2018. SHN readers looking to attend can use the code dc18shn20 to receive 20% off. Why is it an important time to bring the senior living community and Washington together? According to Steve Jurvetson, a venture capitalist, there are three drivers of value – demographics, technology and the regulatory environment. As the boomers move into 73 in 2019, there is a need for a new paradigm for aging in place and senior housing. The government has a huge role to play with the way in which they can help support and reimburse innovation. For the first time, we have a great gathering of entrepreneurs, investors, non profit organizations and the regulators all in the same room discussing opportunity. Groups like AARP, GSA, NCOA and Fannie Mae are taking the lead in facilitating the conversation. We continue to hear more about the longevity economy, where does senior living fit in there? Senior living is one of the largest segments in the longevity economy. The aging in place market is 20 billion in 2020 according to data from Aging In Place Technology Watch. 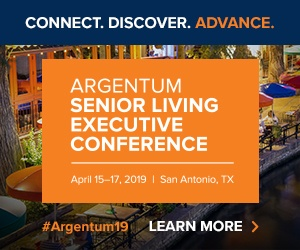 There will be a lot of technology companies at the event, do you think senior living has done a good job embracing the new ideas they are bringing to the table? I think we are in the third inning when it comes to partnership between entrepreneurs and senior housing. But, we are making progress. Companies like Embodied Labs and Sing Fit and INTL are off to a fast start. But there are so many more to come to the table this year. We are very excited about Because – and believe that both home care and senior housing can drive a lot of incremental revenue to the bottom line as they discover the power of online marketplaces as a source of consumer insight and increased efficiency. We are also excited about the work of HumanGood in exploring the customer experience and piloting new solutions. SilverNest provides an exciting alternative for low income older adults. It also provides a new revenue stream in the on demand marketplace. One of the days is about the longevity entrepreneur and the impact of the regulatory environment, do you think the government will be friendly to new ideas to help seniors age in place? Yes – we are very excited to expand on the work of EVP of AARP Nancy LeaMond and her vision for caregiving solutions and livable communities. We believe the right stakeholders are at this summit — from the entrepreneur community as well as the leading organizations in non profit world serving older adults. There are also huge opportunities for health care in using technology to help boomers recover from expected and unexpected surgeries as they access new services in tele health and on demand services at home. The revolution in the longevity marketplace in 2019 reminds me so much of the digital summit that happened 20 years ago with the internet revolution. Global talent is coming together from across the world: Canada, Israel, Japan, China, Korea, Europe as new solutions are proposed for older adults. Private equity, venture capital groups can learn a lot in short time as this valuable summit. We will be sharing research, trends and go to market strategies. It is easy to learn about the market, find a new investment thesis, channels into the market and derisk investments in this space. Do you think the private pay senior living providers need to embrace some form of government assistance as a payor? I think it is time for the conversation to start at an accelerated rate. What are some of the most interesting things you are seeing coming to the senior living marketplace? I am very excited by voice enabled technologies, new staffing solutions that provide more quality of care and empowerment for caregivers through technology, artificial intelligence and virtual reality to make storytelling and online learning more compelling. I think this senior housing industry needs its own PR campaign to show that amazing good work it does to make a difference in lives. The population is the most educated and has time to research; the expectations are higher. There are many many entrepreneurs catching the way. But we haven’t crossed the chasm. It is still early adopters. We can drive a revolution in the innovation hubs around the world (CABHI, AARP, Ziegler Linkage, THRIVE, CITRIS) and share what we learn. Editor’s note: reach out to John at jry [at] seniorhousingnews.com if you will be attending the event, he would love to say hello and catch up.